If you’ve heard of carbon monoxide, a simple two-atom gas, it’s probably from warning about how you should have a detector in your house because it’s fatal to humans. So how can a microorganism get its energy from this stuff? We already know of organisms on Earth that can get energy from gas via a process called oxidation. In simple terms, it means reattaching an oxygen atom to the gas, which transforms it back into carbon dioxide. In doing so, the reaction releases a burst of energy. 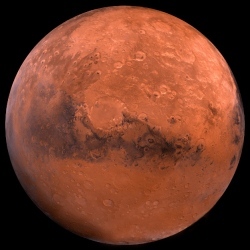 Scientists already know of several compounds in the Martian soil that the plucky hypothetical microbes could use to oxidize their carbon monoxide, such as the molecule perchlorate. But NASA is currently evaluating a proposed mission called Icebreaker Life that would be sent in 2021 and would be able to detect microorganisms. McKay and King agree that this new research provides all the more reason to go forward with such a mission. "Mars is a planet that’s really no longer just a part of our imagination. This is something that’s at our fingertips," says King.